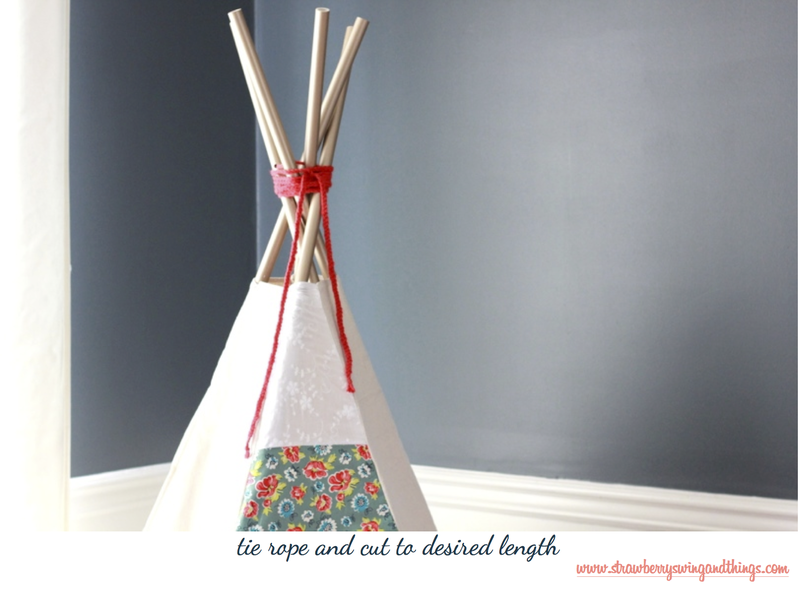 Here it is, Ashlynn's Teepee Tutorial! I'm attempting to be as clear as I can, but I didn't photograph every step so feel free to let me know if I need to clarify anything in the comments. I'm pretty sure sometime last Summer or Fall when the teepee began it's trendy rise to the top of everyone's Pinterest boards, I declared we were getting one for Ashlynn. I found some great options on Etsy, but couldn't pull the trigger on a $150+ purchase for a baby who wasn't even crawling yet. It wasn't a need, and we were planning on moving so I tabled it. Instead I started looking into making my own and realized if I had a sewing machine, I could do it myself for so much cheaper. I'm pretty sure I sent the tutorials to my mom - who does have a sewing machine - along with twenty other tutorials for ruffled diaper covers, princess dresses, cute baby tops, and headbands galore, she instead decided to get me my own sewing machine for my 30th birthday. Of course, the teepee was at the top of my MUST DO list! ... ya know, once I mastered sewing in straight lines and the whole threading a bobbin business. So with a few projects behind me, I decided it was time to get started. 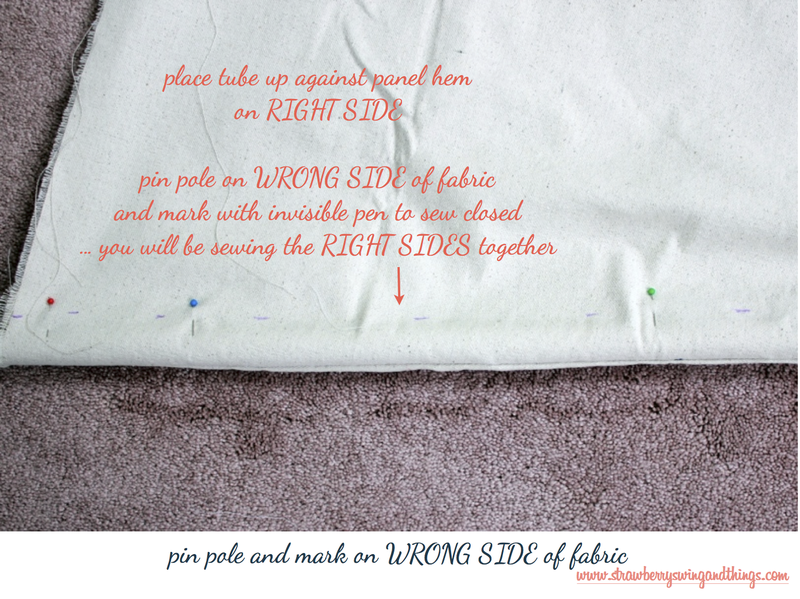 I found a bunch of tutorials on Pinterest and decided this one, by Australian blogger My Poppet, was my favorite. I liked the 5 pole design compared to the 4 pole or and how it really laid it all out step by step. At Christmas, I picked up a queen sized flat sheet on clearance from Target ($13), but when I cut my first panels I wasn't as precise as I should have been. The panels weren't all even and I was scared I didn't leave enough seam allowance since I was pretty sure my poles were a bit thicker than the ones used in the tutorial, meaning I would need a little extra room. So I scrapped the sheet and decided to use canvas. Outside using scrap fabric for the bias tape, a panel where my door was too short, and yarn I had on hand to tie the PVC pipe together, the whole project came in under $50! First up, the poles. It seems like every teepee tutorial I found called for wooden dowels, which unless I wanted to 2" thick (and heavy) pine closet rods, my Lowe's didn't have options in the length I needed. I could have used pieces of trim like quarter round, but I wanted rounded poles so I checked out the piping in the plumbing section and found great and CHEAP options of PVC. Unfortunately, they wouldn't cut down the pipe at my Lowes for us, so we did it at home. The tutorial I used is based in Australia, so the metric measurements didn't match up to our standard. I grabbed the thinnest (and lightest) piping I could find. After cutting our poles from 10' to 6', Pete drilled holes in the pipe using the largest drill bit we had 10" down from the end. After that (we actually did this last, but you might as well get it done now) spray paint the poles your desired color. We only painted the top 14" or so, the amount you'd see peeking out of the top of the tent. This covered up the stamped coding on the PVC and added a little personality to our hangout. Moving on to the cover, I followed the tutorial as closely as I could making a few adjustments for our supplies. First, when I decided to go with canvas for the covering, I picked up a 6'x9' drop cloth to save some money instead of buying yards and yards of fabric. Unfortunately, our teepee needs 5 panels and I was only able to fit 4 on the drop cloth. They do sell a larger drop cloth if you wanted to make the whole canvas, it runs about $25 so the price overall would be about the same. I had thought about hand stamping the canvas, like Sydney from the DayBook did to her tent, but once I realized I was a panel short, I figured I'd add personality through a printed fabric door. 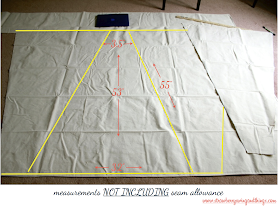 However, BEFORE YOU CUT you have to add in the seam allowance to the outside of your measurements. I was a little generous with my allowances since I know I don't always sew perfectly straight and I didn't want my final panels too narrow or noticeably uneven. To make the door, you can either use a piece of fabric that is long enough or do what I did (which required a lot of thinking, measuring over and over, and luck that it was going to turn out okay!). 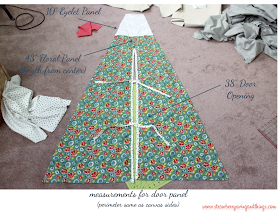 I originally took a 1 1/2 yds of fabric I had purchased for a quilt and realized it fit almost exactly to the length of my canvas panels, however, I didn't want to use this fabric for the door. So I hit Joann's and grabbed 1 1/2 yards of my selected print. However, once home I laid it out and it was too short, what gives? Well, dummy me should have thought about it. I needed a 53" tall panel, plus 1" allowance at the top and 1 1/4" allowance at the bottom, so 55 1/4" of fabric... a yard and half is only 54". And again, since I wanted to be generous with my seam allowances, I needed to get creative. I decided I'd block the top of the panel. So I grabbed some white eyelet fabric I had and decided to make the top 10" inches with that. 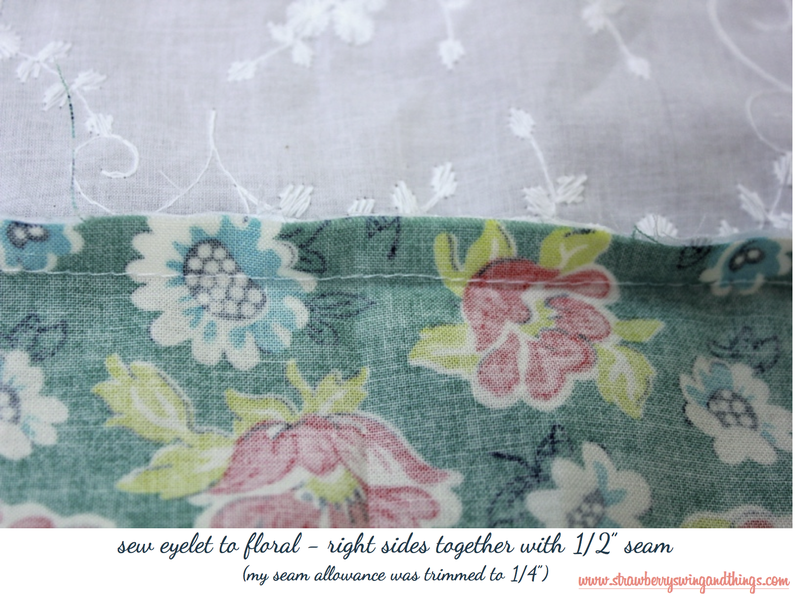 That means my floral fabric was approximately 43" tall, with a 1 1/4" allowance added to the bottom and about 1/2" added to the top to sew the eyelet fabric together. 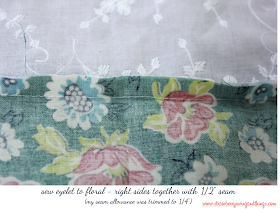 The eyelet fabric was 10" in length, with a 1/2" added to the bottom to attach to the floral print and the recommended 1" allowance at the top. So with my door panels cut, I sewed the eyelet to the floral print fabric (right sides together with 1/2" seam) and now it was time to cut the opening and dress it up with bias tape trim and tie backs. The door length is 38" from the bottom of the fabric (don't worry about adding seam allowance), just make sure you cut your slit straight. I used a rotary cutter for almost all my other cuts, but cut this with scissors to be as precise as possible. Now it's time to finish the cut with some bias tape. I made my bias tape using left over star fabric from my Mini Quilt. 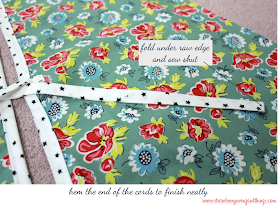 I used Heather's tutorial that she shared on Birch Fabrics Blog. You could easily use store bought bias tape too! I already learned how to attach bias tape when I added it to my quilt, but I didn't want to hand stitch the backside so I half cheated (there are gazillion tutorials on Pinterest, find your favorite!) I opened up my bias tape and sewed the RIGHT SIDE (printed side) to the WRONG SIDE (backside) of my door panel. 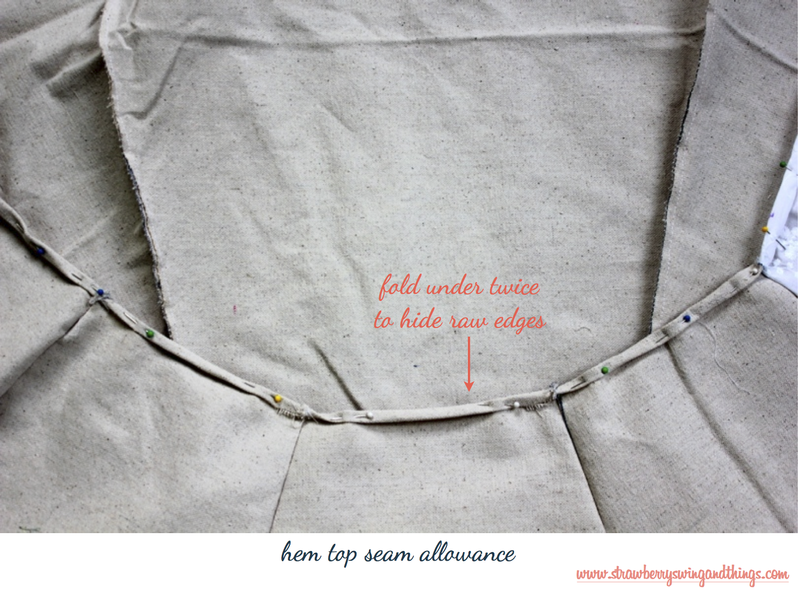 After attached, you just flip the tape closed around the exposed seam and now you are ready to sew to the front. 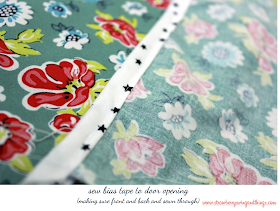 This is where you'd typically do a blind hand stitch... but ain't nobody got time for that! I just fed the tape through the machine making sure to catch both sides. If I did miss the underside, there wasn't much worry since I already sewed it to the back. Again, check out some tutorials on this as I didn't photograph the steps, nor do I want to make this post even longer. Let's stick to the teepee action! Next we need to add our tie backs. 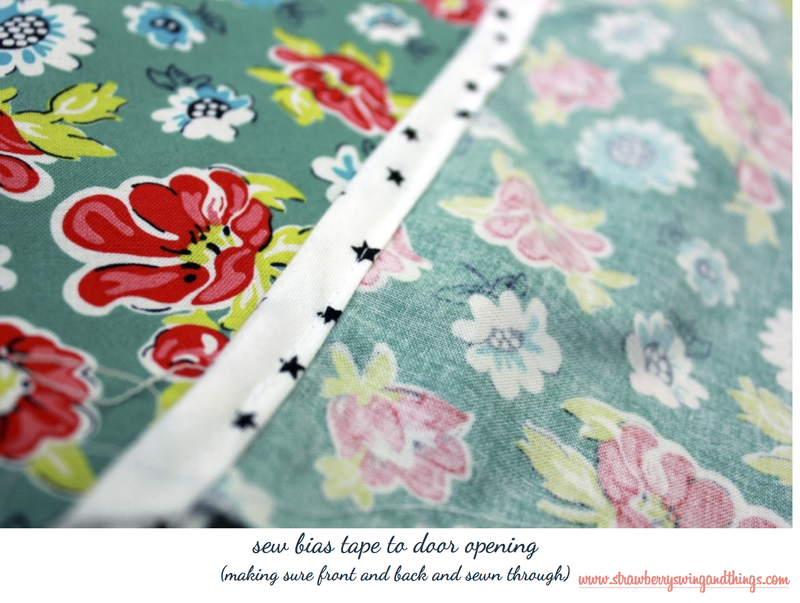 You will need (6) 12" strips of bias tape, sewn closed at the opening to make cords. I pinned my first two 12" down from the top of my door slit and the next two 12" below that. Check the photos for placement and how I attached by folding under the end and making two rows of stitches to make sure it was secure. Note: Before attaching, I closed my open end by folding under, hemming, and trimming the excess so no raw edge would be exposed. Make sure you do 3 seams on the right side with the closure hem at the bottom and the other 3 with seams on the left, again with the hem at the bottom. All my cords are attached with the lengthwise hem at the bottom. I held off on attaching the final two tie backs to the sides until the very end. So keep those two leftover to the side. Now we are ready to attach the panels together. 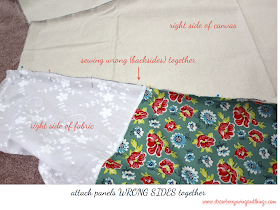 First sew THE WRONGS SIDES TOGETHER, for novices like me, this means the backside of the fabric. This means you will have seams on the outside of the teepee, you haven't made a mistake. Before I sewed the last side of the door to the last canvas panel, I hemmed the top of the teepee. The tutorial has you doing this after all 5 panels are together, but I thought it'd be easier to run through the machine before they were all connected. Your choice. To hem the top, I rolled it down about 1/2" and then another 1/2" so no raw edges were exposed. This accounts for the 1" that you added when you cut your panels. After the top hem is complete, I attached the final sides together. 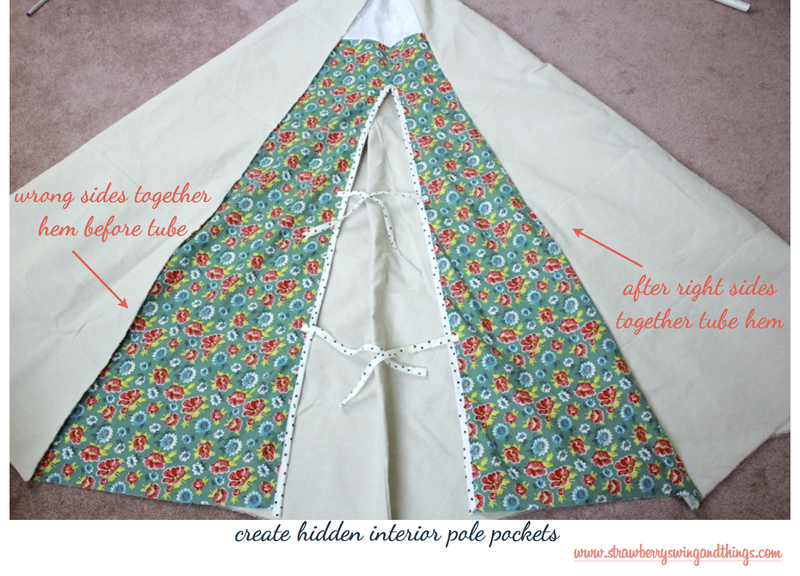 Now it's time to make the hidden pole pockets! This was another area I had to measure a few times to make sure the tutorial didn't have me making a mistake. I measured the diameter of pole and gave some extra room on each side, roughly 1 1/4". I even went as far as pinning the fabric together around the pole to make sure I was getting it somewhat even on both sides and marked with my invisible ink pen to keep my sewing on track. Now to be clear, you want to measure and place the poles ON TOP of the outside seams you already created, so ON TOP of your teepee - NOT THE INSIDE. So with the poles wrapped with the OUTSIDE of the fabric, I made my markings on the inside (this is easiest if you turn your teepee inside out). 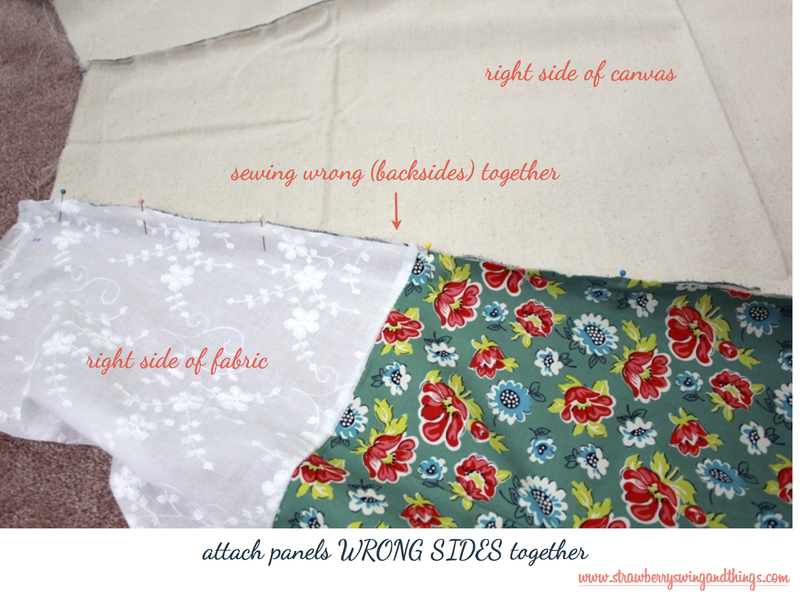 Now, this is where you will sew your RIGHT SIDES TOGETHER (aka the printed or front side of your fabric). When your pockets are complete they will be on the inside of the tent and there will be no visible seam from the exterior (shown three pictures above). It's almost finished friends, get excited! 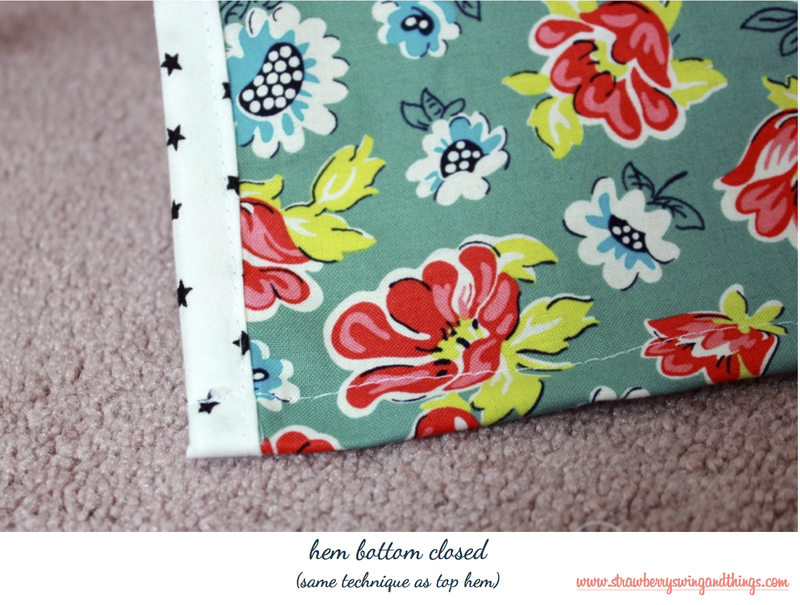 Now to close it off you'll need hem the bottom just like we hemmed the top. 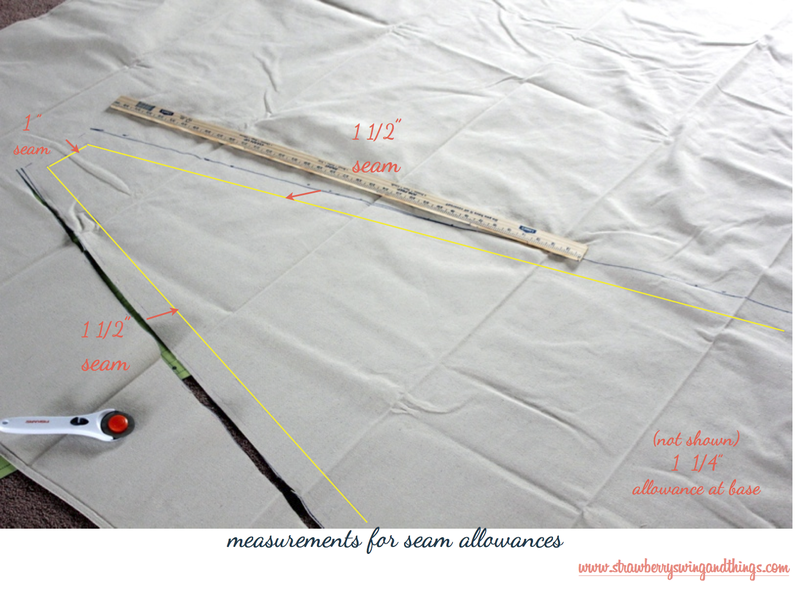 You can make the hem slightly more generous as we have 1 1/4" allowance. Once again, double roll the edge to make sure no raw edges are exposed. The tricky part to this is sewing over the pole pockets to close them off. This will prevent the poles from falling out the bottom. The tutorial wasn't super clear with this step so I did my best. They aren't perfect, mainly because the canvas is so thickly bunched up, but it works and most likely isn't noticeable to anyone else. If I were to actually sell these, I'd try to come up with something that was a little cleaner looking. Now it's time put it all together! Don't worry I didn't forget about the final tie backs, we need to set up the teepee to make sure we get the right placement for those. 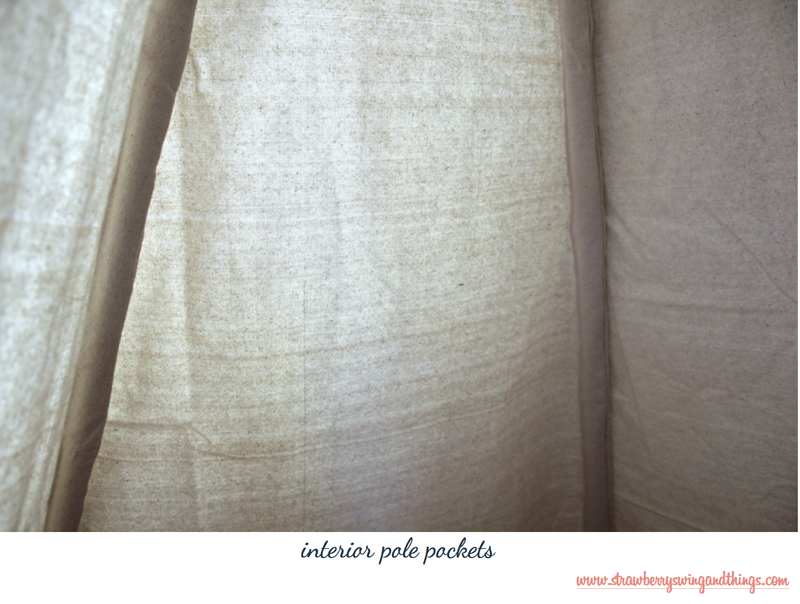 Insert the poles through the pockets, being gentle as not to rip any seams. Once they are in, stand up the teepee and start widening the bottom as far as you can, this may mean you need to mess around with the placement of where the poles overlap. Be careful here as well, as moving them in and out of each other can scratch the spray paint job. Once the teepee is fully extended and you are happy with how the poles overlap at the top, get your last two tie backs and pin where you like them best. The tutorial suggested using them with the bottom ties, but I preferred the look of tying back the top. I placed my tie backs directly on the canvas right outside of the seam where floral door and canvas meet. I did remove my poles to sew them on with the machine, but if you are feeling lazy, go ahead and hand stitch. Just be sure to avoid sewing over the pole pocket. The final step is tying the poles together. This really isn't necessary as it stands up fine on its own, but it pulls it together and makes it look more professional. I used yarn I had braided together into a rope. I taped the end to feed through the holes and once together I tied them as tightly as I could with keeping teepee set up the way I liked (opened as far as it could be). I wrapped my extra length around multiple times and tied it together and let the ends hang free. Boom! You have made your very own custom teepee for a fraction of the price of buying one! - I decided to go with canvas over a cotton sheet because I thought it'd be more stable and durable in the long run. I don't have a 100% cotton teepee to compare to, but I would imagine this one is less likely to collapse under pressure (or falling) of little ones. - However, canvas is not the easiest fabric to sew through. Not only does it constantly shed/unravel, it's thick. So when rolling twice for hems, it's definitely a little tricky getting through the machine. It's also heavy and stiff, so it's not the easiest moving around on the sewing table. 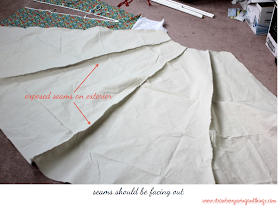 You may want to take this into account depending on your sewing space. I had to constantly re-adjust to make sure I was sewing straight and when the whole thing is attached it's bit annoying moving all over my desk. - I said this earlier, but take your time with your cuts and be precise. 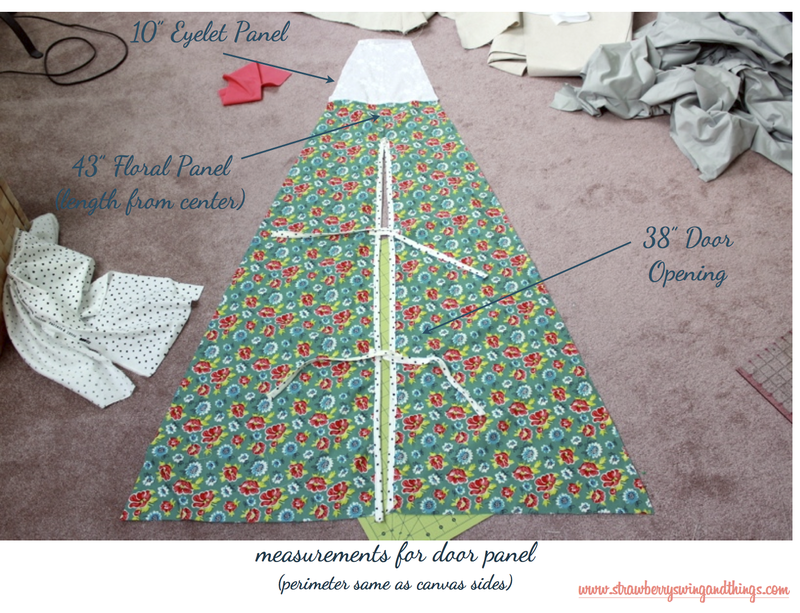 I did use my first cut triangle panel as a template for the others, but I made sure to use my yard stick to outline the entire panel and cut it using my straight edge and rotary cutter (you could easily use scissors). - Don't be afraid to make a mistake, that's what seam rippers are for. - Be patient, aside from making bias tape in advance and cutting my canvas panels earlier in the week - which cutting fabric always seems to be the longest and most stressful part of any project - I did complete this over the weekend during a few hours at night after A went to bed and during a nice long morning nap the day. It's definitely not a single nap time project, but it won't take a year to complete either if your motivated. - Keep the camera close by! You'll want to take pics of your little one seeing it for the first time and how much fun they have playing. Not feeling crafty? Check out Mallow & Graeme for your custom teepee needs! It's so cute and you did a great job. I'd totally make a teepee if I didn't already have a princess tent my mom got Layla for her birthday. ;) I agree cutting out the fabric is a long process. It's the part I dislike the most. 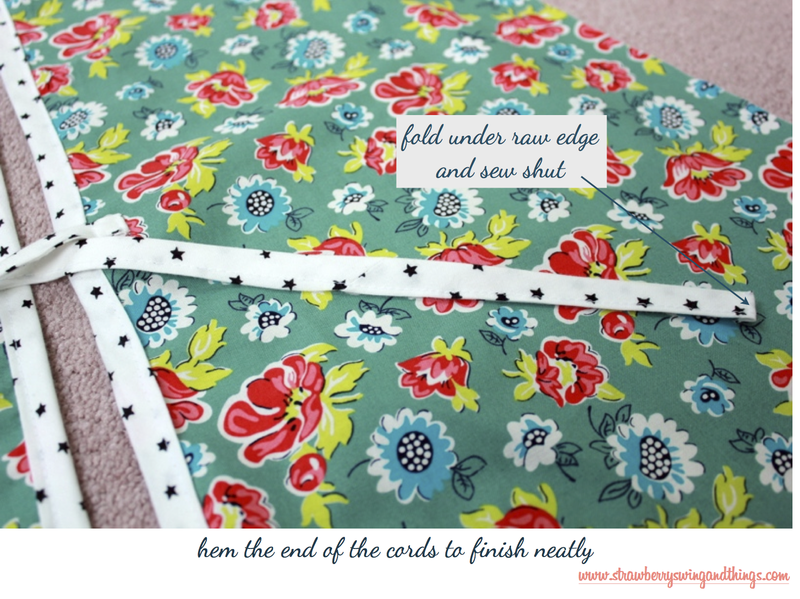 This makes me wish I was better with my sewing machine!! It's seriously SO CUTE!! A is gonna love it for years to come- lex got a teepee for Christmas and plays in it every day... I'm looking forward to slumber parties in it!! Seriously, I've used my machine on 6 projects (all chronicled here)! As long as you take your time, it'd definitely something a novice can do... no zippers, no sewing in curves, puckering, pleating, etc. As you can tell, sewing clothes really intimidates me!! I love that Lex still plays in hers, glad it's not a worn out novelty lol!! This is fantastic! You are so creative and you did SUCH a great job. ! I never would have thought to make my own, but I definitely wouldn't have paid $150 for one either. What sewing machine do you have? I'm interested in buying one but have no clue where to start. I truly learned the bare basics from my mom and learned the rest from pinterest/blog tutorials or youtube videos! I still easily consider myself a novice seamstress! Awesome job!! I cannot sew for the life of me. Would this be doable via a no-sew method? I think you'd be able to do with iron hem tape, but it was take a lot since there are so many seams, that it might actually be more work, You could try to pin the panels with safety pins, it would most likely keep it together, just wouldn't be as secure/sturdy/durable, etc. Let me know if it works! WOW!!! you are one SKILLED mama that is all i have to say! Whenever I look at teepee how to's i get overwhelmed. i'm 100% for sure giving hubby this version (he knows how to sew, i don't!) we will send you the finished project once we're done! don't hold your breath... ;) awesome tutorial...thank yoU! Aw, thanks Natalie! I found a lot tutorials overwhelming or just not very clear too... or some just seemed hard! This one probably seems intense, but it was actually pretty simple. I'm am TOTALLY a novice at sewing, it's all straight stitches and simple hems, basics! LOVE IT! It really turned out great! Is it sad I am going to send the tutorial you did to my Mom instead of even attempting to make one myself?! I really like the fabric you used too. A teepee is on Owen's Christmas list for this year! Not sad, I was always sending things to my mom until she bought me my own machine lol! It'd make a great present from Santa! DYING over this. I am so inspired. I would love to share this with my readers. Say it over at Michelle's. Well done and darling little one! 9 YARDS of rope? That seems like an awful lot. Typo? Yes! That is a typo, thank you for the catch :) It's approximately 9 feet, but could easily use less if needed. I'll update the post now, thank you! I love this, and have been making our own this week. I have it all put together just now, and it's not standing up right... I did make it a little taller, but that doesn't seem like that would matter. Any tips? Did you sew the pole holes together at the bottom? It's a leaning teepee right now... Thanks for the tutorial though! I did hem the bottom of the pole pockets. Without seeing your teepee, the only thing I can think of is that you haven't tied the poles tightly together a few inches above the top of the tent. If the poles aren't tied together it won't be sturdy. I would make sure the poles go all the way to the bottom of the pocket and that they are tied tightly together where they cross over. you did such a great job, I love how it turned out. Thank you, Cintia! And thank you for providing such a great tutorial! I made this teepee from this tutorial. Great job on all the details. There was one part of the tutorial that did not work for me and if I had bothered to do all the math I would have known it would not work. The top of the teepee was not wide enough to allow for the pvc pipes to go through. I had completely finished it before I turned it inside out and noticed. I did a simple solution. I cut 3" off the top of the finished teepee, opened the pipe pockets, re-hemmed and re-sewed the pockets. That worked well for me. It did shorten the teepee and next time I would make the cut panels wider on the top. Thanks so much. A great tip would be to use cotton drop cloth from the hardward store. It is sturdy and will stand up well and it is cheap. played a lot with!! Thanks again. MERCI BEAUCOUP!! Hi! 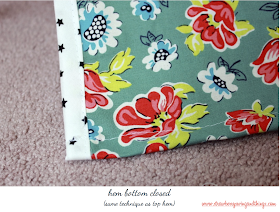 I love this pattern and thank you for "the lessons learned" part--really useful! Could you let me know how many yards I would need in total? You mention 1 1/2 yard forthe flowered door. What about the rest? Thanks! I used a store bought painters canvas (cheaper than buying yardage and more efficient). If you were looking for all fabric, it would be 5 panels x53" roughly 7.5 yards. Hope that helps! Thanks so much for this great tutorial! I made one for my son's birthday! We've had it up for a couple months now and the fabric keeps sliding down the poles and he continues to stretch it wider and wider. Did you have this issue at all? Any tips would be greatly appreciated! Thanks so much! Ok. 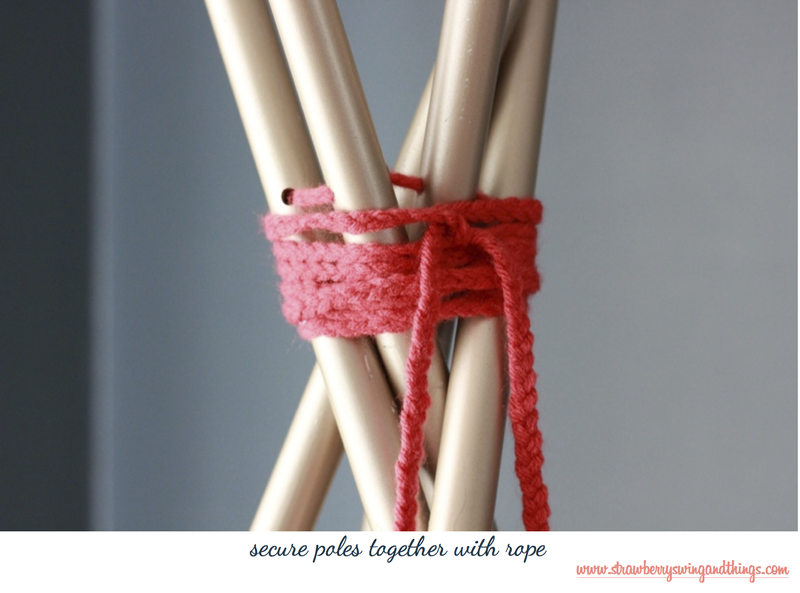 I am in the middle of making this and I am SO confused by the poles. I am very much a visual learner so I am trying super hard to look closely at the pictures. 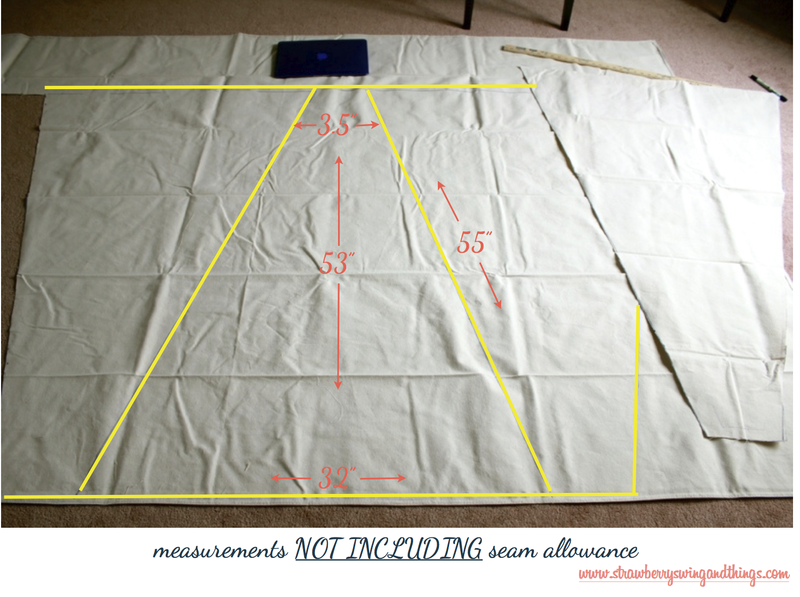 So here is my question… on the inside of the tee-pee you have your 1 1/2 in seam allowance. Where does that go when you sew your hidden pole pockets? Do you take the fabric from the outside of the tee-pee and wrap that around? I'm sorry, these are probably silly questions but I just don't want to mess it all up. Thank you!! The PVC pipe was 1/2" by 12' that we cut to 6'. The pockets I made most likely wouldn't fit a pvc fitting, so you would have to adjust the french hem to be wide enough for it to slide through. While I can comfortably sit inside the teepee with my daughter, I can not stand as it was intended as toddler play space. I would guess standing height is maybe 4'? Thanks for answering my questions. 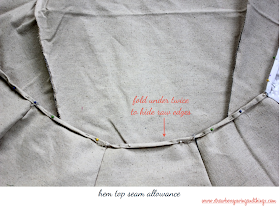 I will give it a try and adjust seams as needed. 4 feet should be a good height. Help...why is my fabric sliding down from the top of the poles??? I followed the instructions but my teepee doesn't seem to be working as easily as yours seems to be, trying to get these done before Christmas!! Do the interior pole pockets fit snuggly around your pvc pipe/poles? If it is too loose, it will probably fall down. 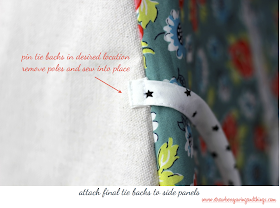 Instead of re-sewing the whole pocket, you can just put a small stitch at the top of the pockets to make them narrower. I hope that helps! Thanks for the tutorial. Here is my teepee http://romeroijuaneta.blogspot.com.es/2015/01/a-teepee-for-my-baby.html and my baby happy with it!! Erinn as I am prepping to make my own teepee I remembered you had a tutorial floating around and oh my stars! This is a lot of work!! Haha. I thought I was going to tackle this myself but after seeing this I am not so sure! What lucky little ladies to have such a crafty mama! It's definitely a bit labor intensive and not a "hack" of sorts, but I promise if you have a beginner's sewing ability, you can do it! It was one of the first (well, the sixth!) thing I ever sewn. 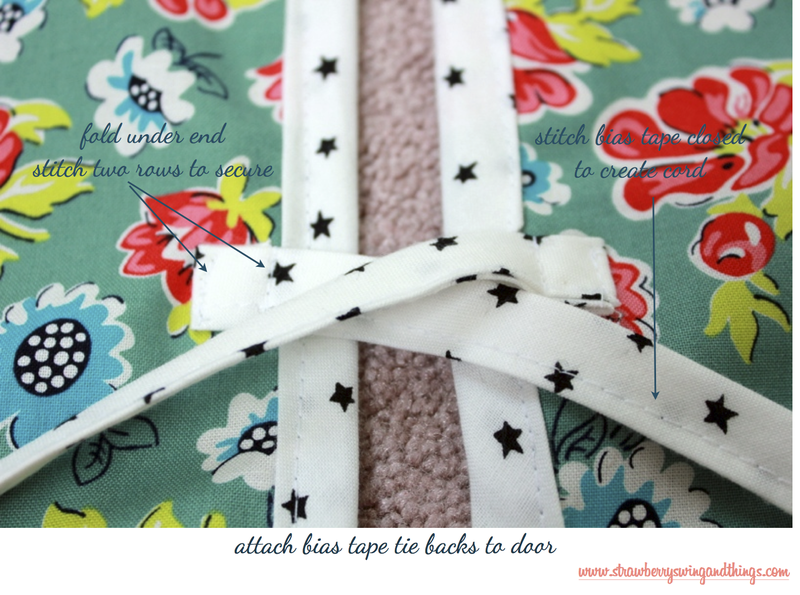 It's all straight lines and you can edit it however you want use ribbon or trim instead of bias tape, skip the tie backs, etc, etc. 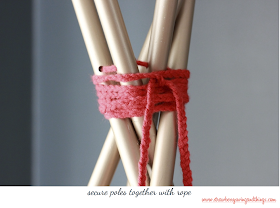 Hell, you could hot glue it all or just use safety pins to hold the fabric around the poles, get creative! You inspired me. I was looking at buying one, but will give your tutorial a go. Feeling excited by the project now. Thank you! Superb and Genius idea !!!! This is such a great tutorial. i love your teepee :) it's my favorite. I used your tutorial to make a teepee for my niece but somewhere along the way i only cut 4 panels :D it came out ok though :) thanks for the great instructions and pictures.